All participants are strongly encouraged to present their research during the workshop. The Poster Session will take place on the evening of Tuesday 9 April with a wine & cheese reception from 18:30 to 21:00. 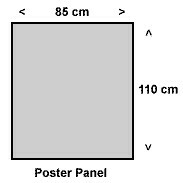 Maximum recommended poster size: 110 cm height x 85 cm wide (or A0 poster format). Velcro tabs to hang the posters will be provided by the organisers.